A couple of years ago, I had the pleasure of working for O'Reilly Media as the editor-in-chief of Craft Magazine. 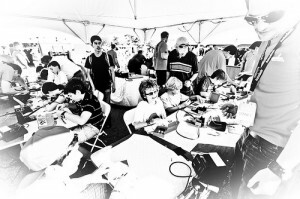 Even before I'd started working there, I attended the first two Maker Faire events, and was amazed by what I saw: part county fair, part science fair, part craft fair, a huge gathering of folks who were brought together with the simple connection of their love of making things. As a part of the staff, I got to work on two Maker Faires and saw first-hand the incredible amount of thought, energy, and hard work that goes into putting on such a large-scale event. 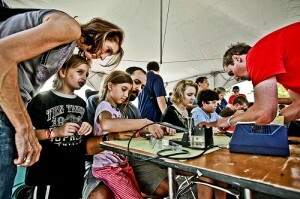 Last week, the event debuted in New York as World Maker Faire. It was always the vision of Dale Dougherty, who founded Maker Media and the Maker Faire, to incorporate education into the world of science, technology, and innovation. In conjunction with that, Dougherty published the following talk given by Thomas Kalil, the Deputy Director for Policy for the White House Office of Science and Technology Policy. Among other points he makes, Kalil talks about the importance of communication between makers, innovators, and tinkerers, and the STEM education communities. What are the projects and initiatives that the Maker and STEM communities should be co-designing and co-creating? What are the big ideas, compelling goals and concrete "next steps" that would inspire individuals, companies, foundations, educators, museums, non-profits, and government agencies to work together? Thomas Kalil: What would education look like after a Maker make-over? On the Monday following Maker Faire New York, the National Science Foundation (NSF) sponsored a workshop titled "Innovation, Education and the Maker Movement." It was organized by Margaret Honey of the New York Hall of Science, Thomas Kalil of the White House Office of Science and Technology Policy, and myself. I asked Tom if we could publish his talk, which opened the workshop. Thomas Kalil: Good morning. It's a pleasure for me to be here. I'd like to begin by thanking Margaret Honey and Dale Dougherty for organizing the workshop, NSF for sponsoring it, and all of you for participating. To kick things off I'd like to provide some preliminary answers to 3 questions. First -- what are the key cultural, social, technological and economic dimensions of the Maker Movement? Obviously -- it begins with the Makers themselves -- who find making, tinkering, inventing, problem-solving, discovering and sharing intrinsically rewarding. These Makers have a strong "Do It Yourself" and "Do It With Others" mindset -- and making is an important element of their personal identity. That's why the tag line of Make Magazine is "technology on your own time." Those of you who had an opportunity to wander around the Maker Faire saw the dazzling array of Maker projects and Maker communities -- like the Madagascar Institute's 360 degree Swing of Death and jet-powered carnival rides or the cellphone-based sensors for carbon dioxide and ambient noise. We saw Makers like the chemist working to create some of the capabilities of a $10,000 Scanning Tunneling Microscope for a few hundred bucks, or the engineer who had the inspired idea to use reverse geocaching to design a wedding present -- a puzzle box that only opens on one spot on the planet. It's work done in many different mediums, including electronics, open source hardware, Howtoons, metal working, DNA, medieval weapons, wood, arts and crafts, robots, rockets, quadrocopters, Diet Coke and Mentos, and fire and other dangerous things. Ideas. Unfiltered, unencumbered, and unapologetically enthusiastic ideas. Ideas that lead to grease-smeared hands, lavender sorbet, things that go bang, clouds of steam, those goggle-marks you see on crazy chemistry geeks, and some guy (or girl) in the background juggling and swinging from a trapeze ... Walk through our door with an open mind, and you are liable to be whisked off your feet and into a project you'd never have thought up. We encourage communal learning, asking questions, and pushing that red button. Go on. Do it. If you stick around long enough, you'll end up being the one creating projects and doing the 3-2-1 countdown for some new toy. Which is exactly what we hope will happen. Technologically -- we are moving towards what MIT's Neil Gershenfeld has called personal fabrication. Consider how Moore's Law has enabled the transition from the expensive and remote mainframe to the personal computer to the smartphone that fits in your pocket to the Internet of things. We are seeing the same phenomena with the dramatic reduction in the cost of the tools needed to design, make and test just about anything -- including $1,200 3D printers, CAD tools, machine tools, sensors, and actuators. Remember the replicator from Star Trek? It's rapidly moving from science fiction to science fact. What will happen as we continue to democratize the tools needed to make physical objects that are smart, aware, networked, customized, functional, and beautiful? I have absolutely no clue -- but I am confident that it will be awesome. As one maker put it, "The renaissance is here, and it brought ice cream." Economically -- we are seeing the early beginnings of a powerful Maker innovation ecosystem. New products and services will allow individuals to not only Design it Yourself, but Make it Yourself and Sell it Yourself. For example, Tech Shops are providing access to 21st century machine tools, in the same way that Kinkos gave millions of small and home-based business access to copying, printing, and shipping, and the combination of cloud computing and Software as a Service is enabling "lean startups" that can explore a new idea for the cost of ramen noodles. Makers are also becoming successful entrepreneurs. Dale just wrote a compelling story about Andrew Archer -- the 22-year-old founder of Detroit-based Robotics Redefined. As a teenager, Andrew started off entering robotics competitions and making printed circuit boards on the kitchen table. He is now building customized robots that transport inventory on the factory floors of auto companies. With more entrepreneurs like Andrew -- we could see a bottom-up renaissance of American manufacturing. Second, why does the Obama Administration believe that the Maker phenomena is important? As you know, President Obama has made science, technology, engineering and math a top priority, and in his inaugural address he honored and celebrated the "risk-takers, the doers, the makers of things." Students will launch rockets, construct miniature windmills, and get their hands dirty. They'll have the chance to build and create -- and maybe destroy just a little bit -- to see the promise of being the makers of things, and not just the consumers of things. So the President is a strong supporter of hands-on, project-based approaches to learning. After all, we wouldn't teach kids how to play football by lecturing to them about football for years and years before allowing them to play. And if education is about the "lighting of a flame not the filling of a pail" -- we should be putting the tools of discovery, invention and fabrication at the finger tips of every child -- inside and outside of the classroom. Several federal agencies are beginning to support these concepts. Zach Lemnios, our Director of Defense Research and Engineering, has made STEM education a priority. Our DARPA Director, Regina Dugan, has called for a "renaissance of wonder." Recently, DARPA announced that it is launching a new initiative called MENTOR -- Manufacturing Experimentation and Outreach. DARPA's goal is to deploy 3D printers in a thousand high schools, and to enable student teams to develop and build vehicles such as mobile robots and go-karts. NSF has been supporting some great work by academic researchers, like Hod Lipson's Fab@Home project and Neil Gershenfeld's global network of Fab Labs. If we make the most of these opportunities -- I am confident that more students will get excited about excelling in STEM subjects and pursuing STEM-related fields. More students will be empowered not just to get a job -- but to create the industries and jobs of the future. More graduates will pursue mechanical or electrical engineering as opposed to financial engineering. More inventors will have an idea that could address the grand challenges of the 21st century, such as solar cells as cheap as paint or tumor-eating bacteria. More citizens will be able to engage effectively in policy debates on scientific and technological issues, such as energy, climate, sustainability, and bio-ethics. Of course, the democratization of technology has risks as well as benefits. But I believe that the benefits will far outweigh the costs -- and that the United States should actively promote distributed innovation. Third -- what are my hopes and dreams for this workshop? I asked Margaret and Dale to convene this workshop because it was my strong sense that there is not nearly enough interaction between Makers on the one hand and STEM educators, researchers, funders, and policy-makers on the other. The history of innovation teaches us that new ideas are almost always the result of novel combinations of existing ideas. So -- just imagine if there was more two-way traffic between the Maker and STEM education communities -- in terms of people, partnerships, ideas, and tools. To be a bit more specific, what would career and technical education look like after a Maker make-over? What would teams of students build with access to a 3-D printer, a Tech Shop, powerful but easy to use CAD tools, and an experienced mentor? What foundational knowledge and practical skills would they acquire along the way -- and what real-world problems could they solve? What are the biggest barriers to bringing Makers and their tools into the classroom and informal learning environments, and what experiments should we launch to overcome or route around these barriers? How do we make a special effort to engage women and under-represented minorities? Recently, President Obama announced that over 100 CEOs had responded to his call to action by joining an organization called "Change the Equation." These CEOs are dedicated to supporting great teachers and inspired learners, and maintaining a long-term national commitment to STEM education. What role could the private sector play if they embraced the Maker Movement? I know that you have many questions and ideas of your own. I'm hoping that by the time we leave today we will have some concrete ideas that are worth pursuing -- with an initial hypothesis about the who, what, where, when, why and how. Thanks again for coming -- I am really looking forward to the discussion. Thomas Kalil is the Deputy Director for Policy, White House Office of Science and Technology Policy.